A pair of Democratic senators penned a letter to the head of the General Services Administration Tuesday asking her to take steps to resolve a situation where federal employees found themselves on the hook for sizable tax bills related to government-paid relocation expenses after agencies made them move for work. But sources at the Senior Executives Association, which first raised the issue, say GSA already is moving toward fixing the problem. A provision of the 2017 tax code overhaul removes the deduction for job-related moving costs and exclusions for employer efforts to defray the cost of relocation. This means as many as 25,000 federal employees each year could face a massive new tax liability when asked by their agency to move for work. SEA first brought the issue to light in a letter to GSA chief Emily Murphy earlier this month, as the issue particularly impacts senior executives, whose mobility is required as part of the job. Some SES members found themselves facing a one-time paycheck deduction of up to $7,000. The association said Tuesday that it has been told that efforts already are underway to alleviate the problem. “GSA has drafted policy to address the situation,” said SEA Executive Director Jason Briefel, although he noted the agency must get approval from Treasury and the Internal Revenue Service before updating its regulatory guidance on the issue. Warner, Kaine and SEA have said the problem could be fixed with a tweak from GSA’s Office of Governmentwide Policy. “The government already has policies in place to make these federal employees whole—the relocation income tax allowance and withholding tax allowance—yet these policies have not yet been adjusted to take into account changes from the tax bill,” the lawmakers wrote. 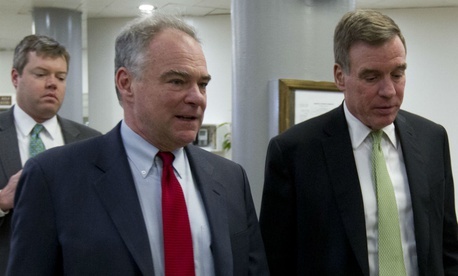 Warner and Kaine urged Murphy to implement the policy changes as quickly as possible, in order to minimize the number of feds negatively affected by the removal of the tax deduction. SEA President Bill Valdez thanked Warner and Kaine in a statement, and reiterated his demand that the issue be "swiftly remedied." "It is sadly ironic that those federal employees most impacted by this mistake include members of the law enforcement community and others who have already sacrificially uprooted their entire lives and relocated in the name of public service," Valdez said. "SEA will continue to track the progress of this situation and work with the appropriate parties, both within the administration and on Capitol Hill, to ensure the necessary policy adjustments are in place."